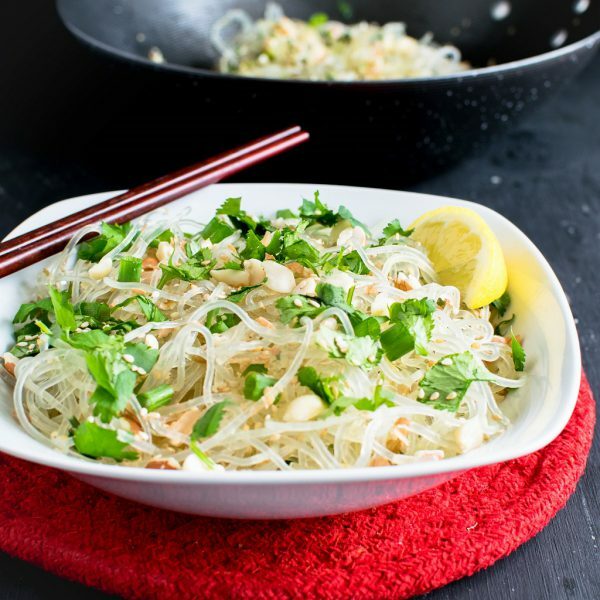 Sesame Peanut Kelp Noodle Stir Fry Salad is a nutritious and low carb savory side dish. It serves excellent as a side salad or in fresh rolls. These are absolutely gluten free and are a great substitute to traditional noodles. Soak the rinsed kelp noodle in warm water for 10 minutes and then drain it. Later trim them with kitchen scissors. In the meanwhile heat oil in a wok and add sesame seeds, white of green onions, crushed peanuts and cilantro and stir fry for 2 minutes. Then, add salt and toss in kelp noodle. Now, with the help of tongs mix it well until well blended for 5 minutes. Lastly, garnish with green of green onions and some more cilantro. Adjust salt and squeeze few drops of lemon juice and enjoy! Make sure to rinse off kelp noodles extremely well. It is crunchy and bland in nature and acquires the taste of the recipe. Its a great side dish or a side salad. Also, feel free to use in fresh rolls made from rice paper wraps.